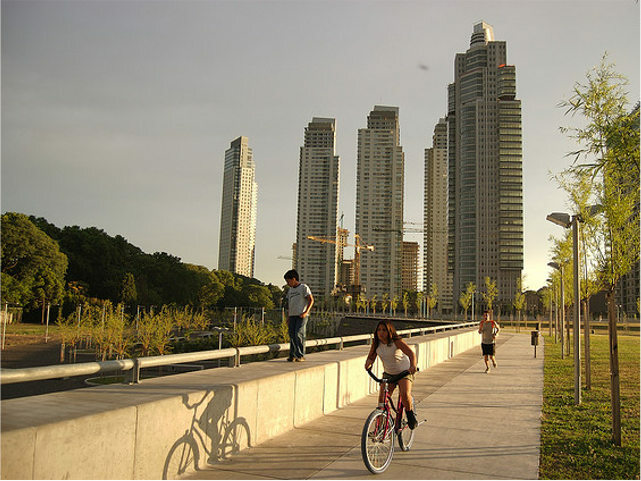 How do we make our cities more people-centric? Photo by Blmurch. If cities are to be more people-oriented, shouldn’t we work on sharing the space with each other? That’s the intention of the Bench of Friendship, upon which it is impossible to sit alone. Sponsored by the British-based Fisherman’s Friend and designed by students from the Institute of Design Hamburg (IN.D), the bench invites those who want to rest or enjoy the view to invite someone else to share the bench with them. Another project which encourages interaction between people is 21 Balançoires (“21 swings”). Created by science students at Canada’s Université du Québec à Montréal (UQAM), together with designers Mouna Andraos and Melissa Mongiant, the installation in the center of Montreal consists of 21 swings, each of which plays a different musical note when moving. The tone increases and decreases in accordance with the motion of each person using the swing. One cool feature of the swingset is that some notes can only be created if different movements are combined, i.e., people create music together with their momentum. The result is a collective symphony! Read more about the 21 Swings on TheCityFix Brasil. Initiatives like these are fine examples of how friendly interactions in urban spaces, however simple they may be, can be very beneficial in making the experience of living in a city more inviting and welcoming. Even if your city does not have the Bench of Friendship or the 21 Swings, a simple smile, a “good day,” or a hug can make all the difference. Maria Fernanda Cavalcanti also contributed to this post, originally published on TheCityFix Brasil.